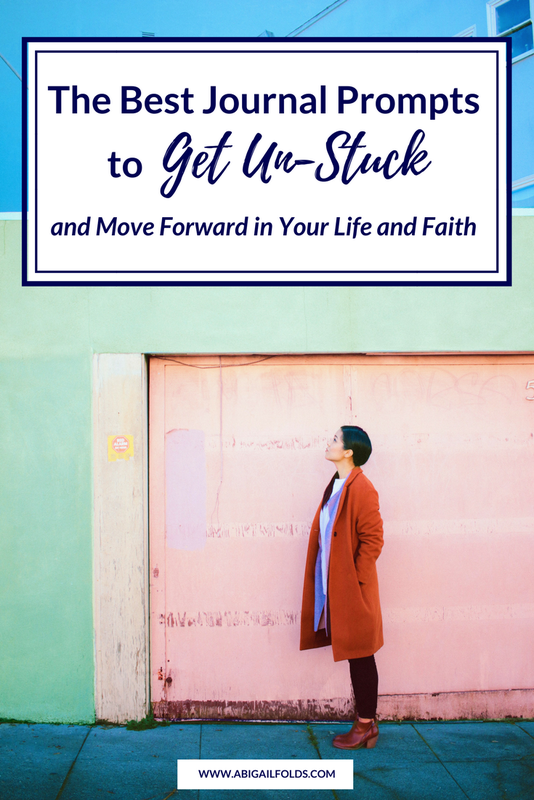 Have you ever felt like you were just spinning your wheels, unable to move forward past a certain point in your life or in your spiritual growth? I’ve felt stuck, unmotivated, frustrated, and sometimes even confused as to why I couldn’t seem to get on with life or grow closer to the Lord. My life felt like it had come to a complete stop. My prayers seemed to just bounce off the ceiling. If this sounds familiar to you, then read on, my friend. I’m sharing some questions that you can ask yourself as you think about your situation and brainstorm how you can make changes and begin to move forward. These questions can also be used as journal prompts or even prayer prompts! By the way, having journal prompts on hand is a great way to process our thoughts, feelings, and the situations themselves. Journaling can reveal things we didn’t even know were there, especially if we’re asking God for wisdom and insight as we journal. If you’re not a journaler, sit down and ask yourself these questions. Be sure to think through your answers, and even if you don’t write a lot, I still recommend at least writing down the main thoughts or ideas that come to your mind as you’re thinking. It can be so easy to have a great thought, only to forget it right away, and I’m pretty sure you won’t want to forget any big “aha” moments that pop up about how you can move forward in your life and faith. 1. Is there anything I already know God wants me to start doing? The key word here is anything. Does God want you to pray more? Take better care of yourself? Get involved at church or volunteer somewhere? Express gratitude more often? Get more sleep? Reconnect with a friend? Many times, we already have an idea of what we need to do, or at least of where we need to start, but we’ve been avoiding it for various reasons, like fear, laziness, or we just straight up don’t want to do what He’s nudging us to do. 2. What will I need to change for __________ (answer to question one) to happen? Even small changes can make the biggest difference, especially when you’re feeling stuck! Becoming aware of these necessary changes (and writing them down!) is the first step toward actually making the necessary changes. 3. Is there anything I already know God wants me to stop doing? Again, the key word is anything - big or small. Does God want you to stop complaining? Oversleeping? Overspending? Overeating? Isolating yourself from friends and loved ones? Also, just like we typically know what we need to start doing, we also usually know at least one thing we need to stop doing. By identifying it, we can begin to actually work on stopping whatever it is. 4. What will I need to change for __________ (answer to question three) to stop? Start small! What’s the first step you can take today toward stopping whatever it is you want to stop doing? 5. What’s working well for me right now in my life and faith? Identify what thoughts, daily habits, actions, relationships, etc. are supporting and benefiting you both in your life and in your spiritual growth, and keep doing those things. Are there any that you need more of or that you can take up a notch? 6. What’s not working well for me right now? Again, identify anything that’s not working for you. It can be something as small as the time you wake up each day or as big as your job or career. 7. How can I grow or nurture the areas of my life and faith that are working well? If you’ve been choosing positive thoughts in one area, can you begin to choose positive thoughts in another area as well? If you’ve enjoyed chatting with the new member of your small group, could you ask her to lunch one day to see if there’s a potential for friendship there? If exercising in the evening works better for you, can you rearrange your day to make it happen instead of forcing yourself to do it in the morning or skipping it altogether? 8. How can I change or let go of the things that aren’t working for me? Sometimes, it’s not possible to make a huge change right away, but identifying a starting point and some first steps can be highly motivating and encouraging when you’re feeling stuck and like nothing will ever change. For example, quitting your job on the spot with nothing else lined up isn’t always a wise idea, but maybe a starting point would be prayerfully changing your focus or the way you think about your current job. The next step could be something like praying for a new job as you update your resume, or maybe starting to volunteer in a place you’d be interested in, or maybe just finding a hobby or ministry you feel called to and enjoy. 9. Have I prayed about my situation? Have you prayed over your answers to questions 1-8? If yes, have you completely surrendered your situation to Him? Have you asked for His wisdom in moving forward? Have you asked for His help in growing closer to Him? Have you sought His glory above all else? If no, set aside some time to pray over everything you’ve discovered in your journaling time while answering these questions. Give your situation over to Him, and ask for His help moving forward. Ask Him how you can better glorify Him where you’re at right now. I hope these questions were helpful! Any growth or change can take time, so be patient with yourself and kind to yourself as you're pushing past the discomfort and frustration of being stuck, and take small steps forward each day as the Lord leads you. If you’d like some 1-on-1 support as you’re beginning to move forward in your life and faith, I’ve got you covered. Click the button below to read more about how we can work together on your journey. Older PostAre You Ready to Pursue Your Calling?